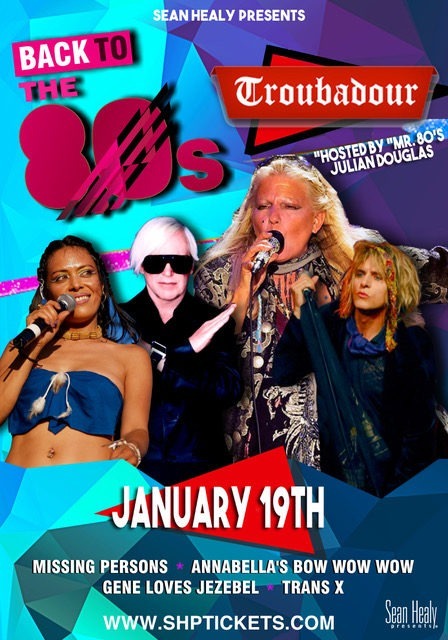 DALE BOZZIO and MISSING PERSONS will be performing all their Greatest Hits… “Walking In L.A.”, “Words”, “Destination Unknown”, “Mental Hopscotch”, “Windows”, “Give”, “Right Now”, “I Like Boys”, “Noticeable Ones”, “It Ain’t None Of Your Business” and the list goes on. Featuring original lead singer ANNABELLA LWIN. Performing their smash hits… “I Want Candy”, “Do You Wanna Hold Me?”, “Baby, Oh No”, “Aphrodisiac”, “Go Wild In The Country”, “W.O.R.K.”, “C30, C60, C90 Go” and more. GENE LOVES JEZEBEL were a staple on MTV and radio during the 1980’s and early 1990’s, collecting 10 songs that made Billboard’s Hot 100, “Desire (Come and Get It)”, “Heartache”, “The Motion Of Love”, “Jealous”, “Twenty Killer Hurts”, “Gorgeous”, “Sweetest Thing”, “Suspicion”, “Kiss Of Life” and “Upstairs”. Here some of those hits and many more! Performing their Dance-Club hit “Living On Video” and more. Yours truly “Mr. 80’s”… Julian Douglas, spinning the hottest 80’s “Flashback Favorites”, New Wave Hits all night long !!! Doors open at 8:00 PM. All Ages Show.